Every year’s the same: the good weather arrives and you can’t resist the urge to take a dip! Charente is full of fresh water swimming spots surrounded by beautiful scenery. Here are our top five spots for swimming in the lakes of Charente and Charente-Maritime. Fancy a break five minutes away from Angoulême? Head to Grande Prairie Lake! This 23-hectare stretch of water offers a range of leisure activities, including canoeing and sailing at the water sports centre (where successful French yacht racer François Gabart cut his teeth); a 3km loop around the lake designed for runners, walkers and cyclists; shady spots for family picnics; a play area for children and a swimming area with a lifeguard (in summer). You can even get to the nearby Nautilis water park! Grande Prairie Lake is also the starting point for the Coulée Verte, a former towpath that runs along the Charente River for almost 20km. It’s an excellent shady route to cover on foot or by bike and explore the remains of the industries that took place on the river prior to the arrival of the railways. Guerlie beach in Pressignac: for nature lovers! Located on the shores of Lake Lavaud, this sandy beach is nestled in a green oasis and offers many leisure activities, so you can make the most of the 200 hectares of fresh water that makes up this lake in Upper Charente. There’s swimming, of course (with a lifeguard in summer), but also a water sports centre where you can take to a sailboat, canoe, catamaran or even a tiralo, an aid that allows people living with a disability to enjoy the pleasures of swimming. A picnic area, children’s playground, mini golf and snack bar are also available at this very popular site. 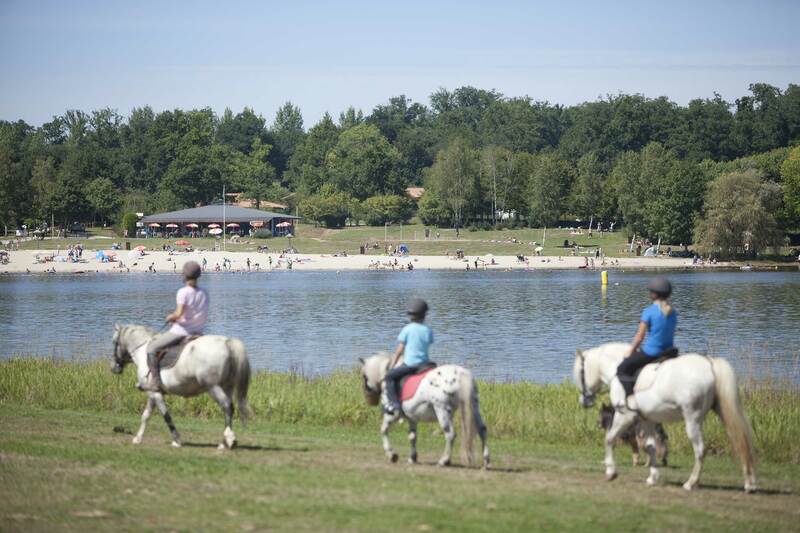 And if you fancy a horseback ride to explore the natural environment around the lakes of Upper Charente, the nearby equestrian centre and camp site is the place to go for unforgettable moments. This leisure park at the heart of Upper Saintonge offers a host of activities across two lakes. There’s a sandy beach with a lifeguard (in summer), a children’s play area, beach volleyball, a boules pitch and fishing. For those who hate sitting still, there are also many instructor-led activities (for an extra fee), including sailing, paddle-boarding, pedalo riding, mini boats, trampolines, a high ropes course in the trees, a climbing wall, a zip line and inflatables. And if you’re feeling hungry after all that, there’s a restaurant on site! Nestling at the heart of the Double Saintongeaise pine forest, this leisure park features a lake with a lovely sandy beach that’s perfect for taking a dip, plus a whole range of leisure activities, including pedalos, children’s games, water bikes and a miniature port where the little ones can learn to captain a fishing boat or a steamboat! After having a dip, you can go for lunch, grab some refreshments and even extend your visit to include dinner on the terrace! These huge quarries, which provided clay for tile-making, have been reborn as superb lakes. The Prés de Peyras leisure park has one lake for fishing and pedalos, and another bordered by a sandy beach for swimming (with a lifeguard in summer). This green setting with a picnic area, children’s play area, beach volleyball pitch and snack bar has got everything you need for a great day in the heart of nature.